What could possibly be wrong with a sumptuous mouthful of cream, chocolate and butter? If your genetic profile is anything like mine, there’s a lot wrong with these delicious truffles. As a matter of fact, I might as well bypass my digestive system completely and stick these directly onto my hips and thighs, since I’m incapable of eating just one. Who can, really? Belgium’s love affair with chocolate ‘pralines’ & truffles traditionally unfolds at various quaint country tables, adorned with one’s best china and grandma’s hand-embroidered floral table cloth. Neighbors and friends eagerly gather around to catch up on the latest small town gossip, and to reconcile important town data such as who is getting married to whom and what was it that Marie overheard whilst standing in line at the butcher’s? To facilitate these impromptu social gatherings, a pot of freshly brewed coffee is there to loosen the tongues and the sugary sweetness of truffles is presented to melt away the bitter shock of hearing that the elderly pastor now has a pretty new housekeeper… and why is she so young? Not proper, I say. Coffee is consumed by the liter in rural Flanders & beyond. You can’t ring someone’s doorbell without being beckoned to sit down at the kitchen table and have an unsolicited cup of joe appear under your nose within the first 5 minutes of entering, usually followed by an invitation to grab something from a box of sweets that permanently lives in the middle of the table. To my mom’s generation, a knock on the door holds the promise of an exciting bit of town gossip and one must be prepared for this kind of opportunity 24/7. No Belgian household is without coffee or chocolate. It’s just not proper. The truffle recipe below is an old-fashioned, artisan recipe I found online years ago. I tweaked it for flavor & richness of texture, but it’s fairly authentic and you can proudly serve these in a bowl… on your granny’s hand-crocheted doily. For good measure. In a bowl, break chocolate into bite-size pieces and set aside. In a small sauce pan, heat heavy whipping cream over a medium heat until very hot. Add butter and stir until butter is melted. Then pour hot cream mixture over chocolate pieces and stir until all chocolate is melted and you achieve a smooth mass. Place a piece of plastic wrap directly onto the surface of the chocolate mass, and refrigerate for a few hours until ganache is set. When cold and stiff, take ganache out of the refrigerator. Using a double-boiler method, melt remaining chocolate for coating in a small saucepan. When melted and cool enough to handle, scoop small balls out of the ganache and gently coat them with the melted chocolate. Needless to say, coating the truffles is by far the messiest part of this recipe, but there’s no avoiding it so you might as well enjoy the mess. The best way to coat the truffles, is by gently rolling them around in the melted chocolate, using a chopstick or toothpick. When coated, immediately take them out of the melted chocolate with a toothpick and roll them in a coating of your choice. Traditionally, semi-sweet cocoa powder is used, but you can also use chopped nuts, chocolate sprinkles, chocolate shavings, coconut flakes.. whatever you fancy, really. 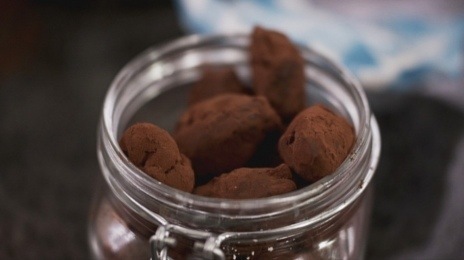 Place the coated truffles on a parchment lined plate, and let harden in the fridge a little before serving. Coat truffles with semi-sweet cocoa powder. Roll truffles in white chocolate shavings. Hi, thanks for linking up to my party Swap N Share Sundays. I am not familiar with your blog. I will look you up on the other social media links to follow.